99% of the french people here in this forum have absolutely no respect, so it doesn´t help to tell them to write in english (I ignore them all the time now). You make them even more angry and they alert you to the inactive moderators. This whole board is a complete farce nowadays, so we do best to stay away from here. Everytime I look into this board, most people are going rampage anyway. Only the off-topic section is still okay. German precision is not just a legend. I am french and i totally understand that we must write in English, even for those who don't have capacity they can use a translator. Even if it's not perfect (our English or the translated text) it's better than nothing, and this topic is "English language"
We can also create a french topic if needed. Vetea va être ravis de voir que cette sempiternelle querelle linguistique stérile "dont lui même s'en cague d'une force" vous intéresse bien plus que son jeu. @Tokay: I´m not sure yet. It looks like a fun game, but there are other games as well to come from Piko (Custodian, Pinkie) and a Master System game from CollectorVision. Recently, I decided to invest in games that I think they are good, because my budget is very limited. All I can tell you is that I´m gonna write articles for Tanglewood and Xeno Crisis when the time has come =) I am very interested in Papi Reloaded. My Collaboration with Tectoy is not a joke. Why do you say that ?? I work with them for the elaboration of the Papi Commando Reload Demo, they send me their MD Console to debug my project. Then, they are on other big project, but they look for this one. A new game for the MD on 2018 is a good surprise no ? Each project I work for, I do always my best with no money from other, only my passion, my time and sometimes my heatlh. If people don't follow this game, that's the Rule and I can understand. But I can say that : BOBC SE will be a great game for any MD and RetroGame Fan. BOBC SE is very promising. I bought the previous one (and did not regret it) and will get this one as well. It has 2 players mode(?) 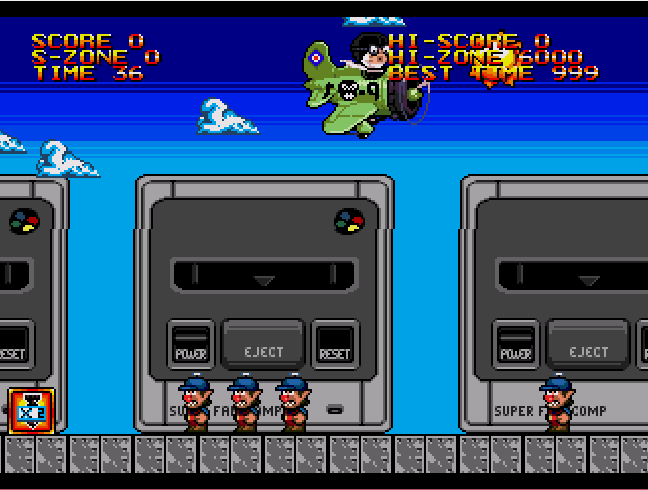 and a variety of levels that makes it (i think) better than Papi Commando.